Inspired by the elliptic orbit of a planet around the sun, a motion that is created by the harmony and balance of unseen forces represented with the glass and the light. ... real eye catcher.The chrome version has an exclusive outer chrome coating that looks metallic when the lamp is off, but turns to dark beige when the lamp is on. ... void, constantly evolving from every perspective. THE AUTHENTICITY OF EACH PIECE IS GUARANTEED NUMERICALLY, STATED ON THE LAMP AND ID CARD. ... generates reflections in the body of the luminaire, which gives it a floating character. The SCONFINE Sfera LED combines all of the advantages of LED technology with room-determining aesthetics. Hugo Tejada Studio designed BANYO, with metal frame and new concept solution for the hand-made braided cord lampshade, which enhances the light effects. Wide range of sizes & colors. ... eavesdroppers from hearing your private conversations and reduces external noise levels to a minimum. This noise-reducing pendant accommodates the demand for both sound absorption and light. Create a majestic sense of serenity with this geometric sound-absorbing pendant light. With a powerful light output it helps you light up your mind while reducing noise for improved focus. 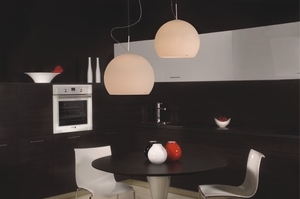 ... created CALLA Suspension Light. With a graceful aged brass top in the shape of elegant leafs, the beauty of this suspension lamp is undeniable. A pendant lamp hangs from the ceiling. ArchiExpo classifies this type of fixture by style, including design, contemporary and classic. Pendant lamps are versatile and useful in many different settings, including areas devoted to work, reading or relaxation. They are found in homes, offices, stores, factories and any covered space protected from strong winds. Choice will depend on the size and nature of the space to be illuminated, be it a reading, eating, work or leisure area. Ceiling height is another factor to consider.